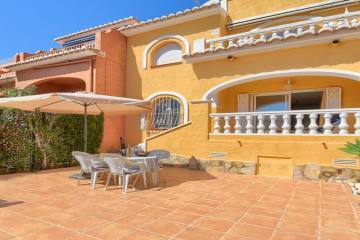 120m2 well-maintained villa in Los Molinos Benitachell. The property consists of a living / dining room with fireplace, open fully equipped kitchen, two double bedrooms and two bathrooms. The villa is double glazed and has central heating and air conditioning in the bedrooms. The garden has an 8 x 5m kidney shaped swimming pool along with an automatic irrigation system and both open and covered terraces.